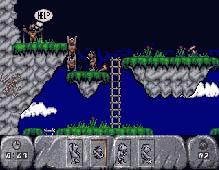 Some of the most original puzzle games ever created, similarities to Psygnosis' Lemmings notwithstanding, The Humans games let you help our predecessors the cavemen progress through the Stone Age and beyond. The puzzles are very engaging: they involve making use of new items (e.g. fire, the wheel) as the cavemen discover them, and co-ordinating activities of two or more cavemen, to pass the level. Too bad the third game Evolution: Lost in Time is bogged down by extremely frustrating puzzles.